RECENTLY, I facilitated a "fireside chat" with Ms Brenda Freeman, who had just joined DreamWorks Animation as global head of television marketing after holding several other top positions in entertainment and corporate marketing, in front of an audience of nearly 250 women. 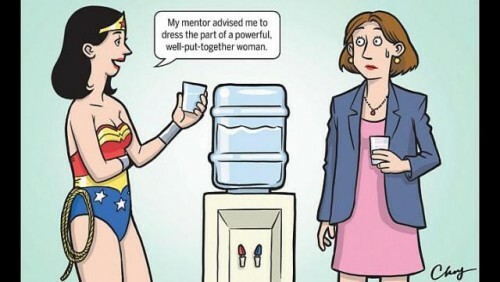 Find good mentors and role models. Seek them out - do not wait for them to come to you. Look for a role model a few levels higher in your organisation or field and build a relationship. Start by asking that person to coffee (as Ms Freeman says, it is less of a commitment for them than lunch so they are more inclined to agree to meet). Forge mentor relationships with several people and continue to do so throughout your career - even when you reach the leadership level. "I have my own 'board of directors' that I like to go to when I make big career decisions," said Ms Freeman. Volunteer for stretch assignments and have confidence that you can perform the job well. Your male counterparts will be stepping up to the plate with plenty of confidence. Do not expect to start moving up the ranks as soon as you join an organisation. First, you have to spend the time working hard and proving yourself. You have to deliver. In the beginning of your career, focus mostly on the hard skills. When you become a director and start managing people, it is a total flip. Soft skills become more important the more senior you get. Get in a role you really love. Then it will not seem like work. As Ms Freeman said: "You have to be really passionate about what you do, because you have to spend a lot of hours doing it. When you love what you do, you are usually really good at what you do." Women especially need a strong network of people to help manage the demands of work and family life. Always be very strategic about your messaging. Everything from your clothes to how you speak makes a statement. If you want to be a woman in leadership, dress the part of a powerful, well-put-together woman. When you speak, do not be apologetic; be confident. Lead in a way that makes you comfortable. Do not lead like your male counterparts or like how you think you should lead. Find a style that works for you. Morph your own communication style for your position. This will help you lead in a way that will not be off-putting to those you manage or work with. Ms Freeman talked about how different the culture was in organisations where she has worked, from the fast-paced media world in New York, to the "southern hospitality" of Atlanta, to the laid-back creative vibe in Los Angeles. Find an organisational culture that works for your own style. Do not avoid confrontation and conflict. Just be strategic about how you manage it. Managing conflict is probably one of the most critical skills. As Ms Freeman said, you do not want to be labelled as the emotional woman. You also do not want to fall on the other end of the spectrum as "cold" or "unfeeling". "A lot of it is being an incredible student of human behaviour and being in tune with the culture you are in," she said. Accept that it will not be perfect. You will probably never have enough time for all of the stakeholders in your life. "You have to let it go and say I'm going to enjoy this ride because I only have one," Ms Freeman said. Managers set the tone for their team and organisation as role models. People are always watching what you do. By demonstrating that you are flexible and strive for balance (such as with work schedules, teleworking, family commitments, and so on), your team will know it is OK to ask for those things, too. Then get out of their way. Do not be afraid to hire people smarter than you and give them the space to do things their way, even it is not the way you would do it. "It's about empowerment; not micro-management," Ms Freeman said.